"Adapt and split any source to any device !" 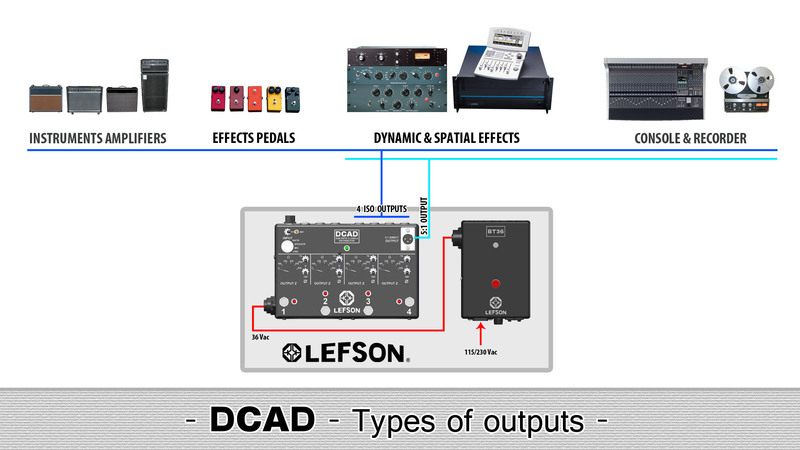 Here you will find more explanations of what you can do by using the Lefson DCAD. Splitter for all types of audio signals, reamper or DI-box, this device is really multipurpose and will help you in any situation. Don't hesitate to contact us if you have any question. 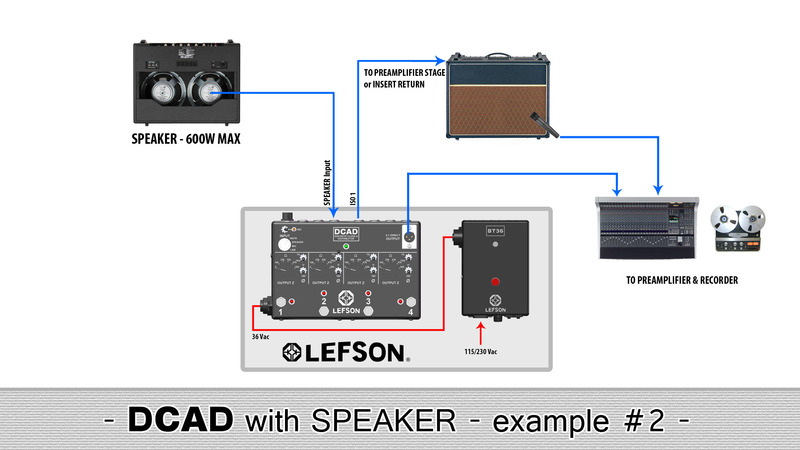 The Lefson DCAD can process all types of audio signals : from instrument, microphone, line, and even the high level of a speaker. You just have to put the "input selection" rotary switch in the correct position. 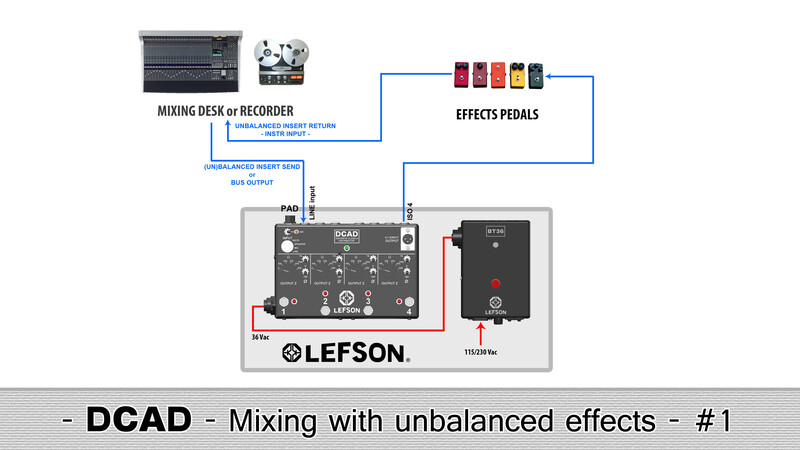 The Lefson DCAD can be connected to many devices such as instrument amplifiers or effects pedals, and all line level devices as dynamics and spatial effects, mixing console, recorder, etc... The four ISO outputs can be balanced or unbalanced, by using the TRS/TS switches. 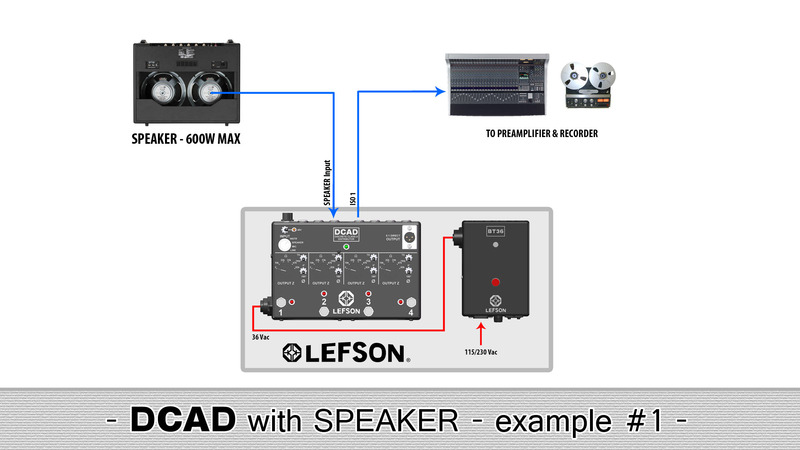 The Lefson DCAD is fitted with an high impedance unbalanced input, named INSTR. 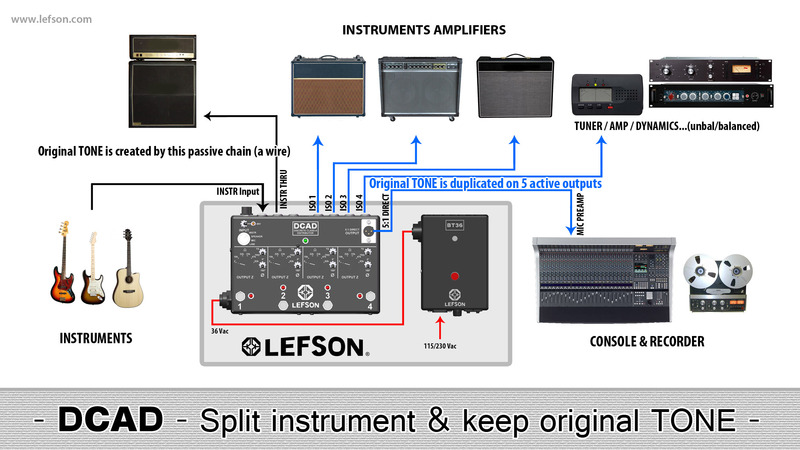 Directly in parallel of it, a THRU output can be used with an amplifier, to create an original Tone. 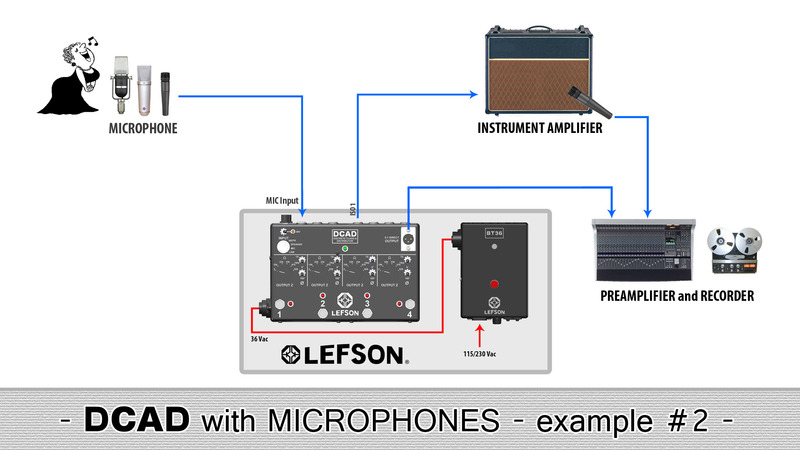 The four ISO outputs can be connected in several amplifiers without any spectral or level loss, a tuner, or dynamics. The 5:1 DIRECT OUTPUT is used as a direct input box, no matter if all the ISO outputs are muted. 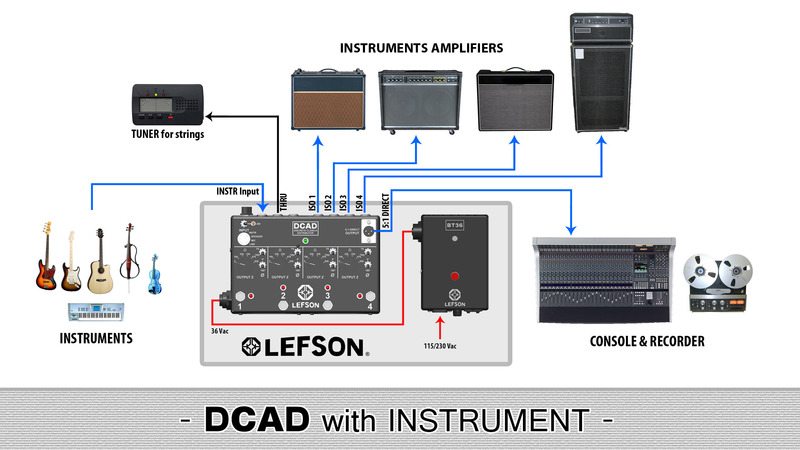 The Lefson DCAD is fitted with an high impedance unbalanced input, named INSTR. Directly in parallel of it, a THRU output can be used, for example, to connect a tuner. The four ISO outputs are connected in several amplifiers. The 5:1 DIRECT OUTPUT is used as a direct input box, no matter if all the ISO outputs are muted. 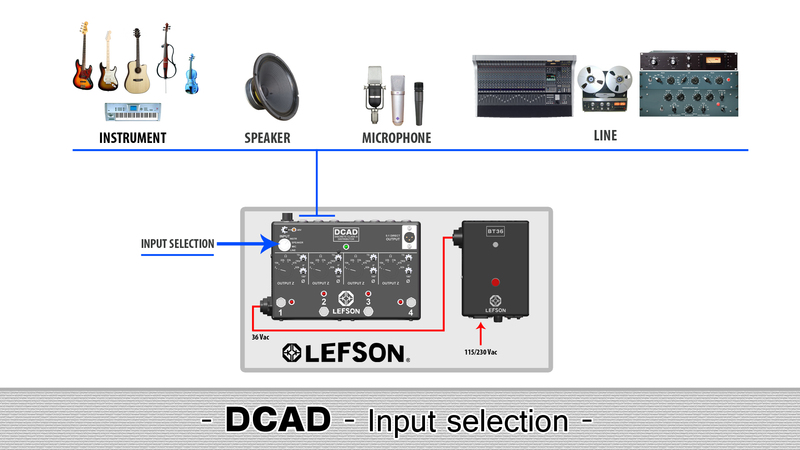 The Lefson DCAD is fitted with a transformer balanced microphone input. 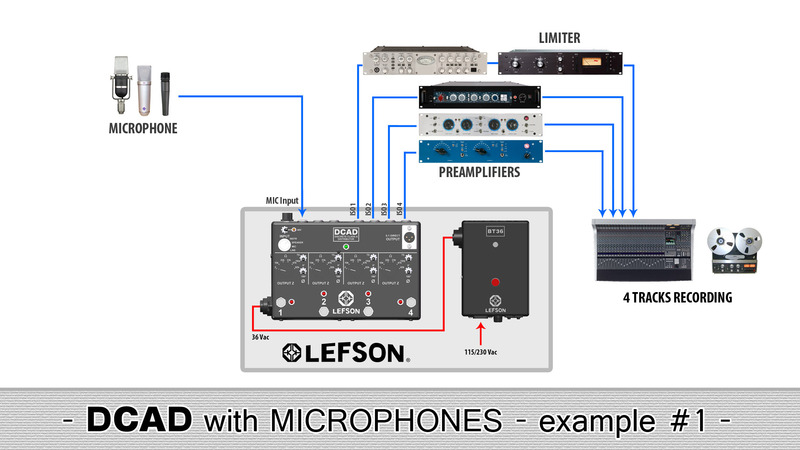 A discrete 48V phantom power supply will allow you to use all types of microphones. A rotary PAD attenuator can be activated to obtain until 60dB of level reduction on this input. 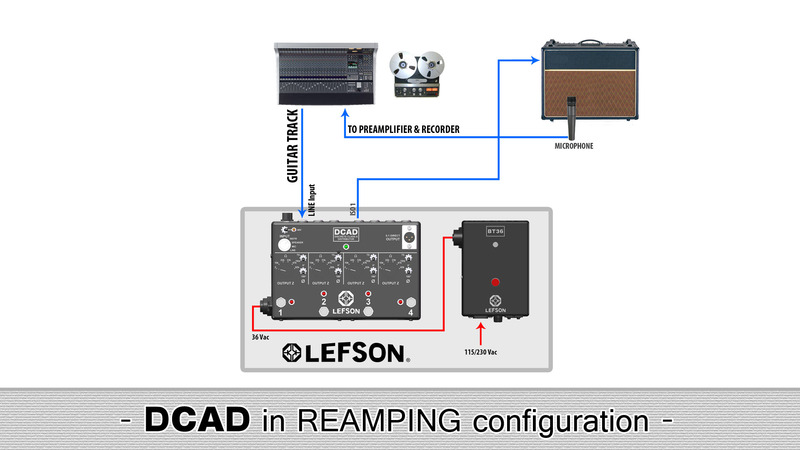 As the Lefson DCAD is fitted with a transformer balanced line input, you can easily use it to reamp anything. 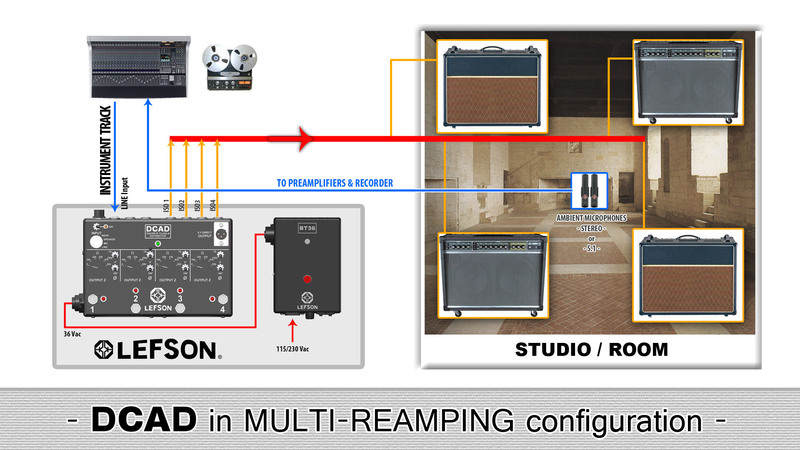 Connect an ISO output to an amplifier, adjust the value of the impedance, select the TS unbalanced position, and reamp ! 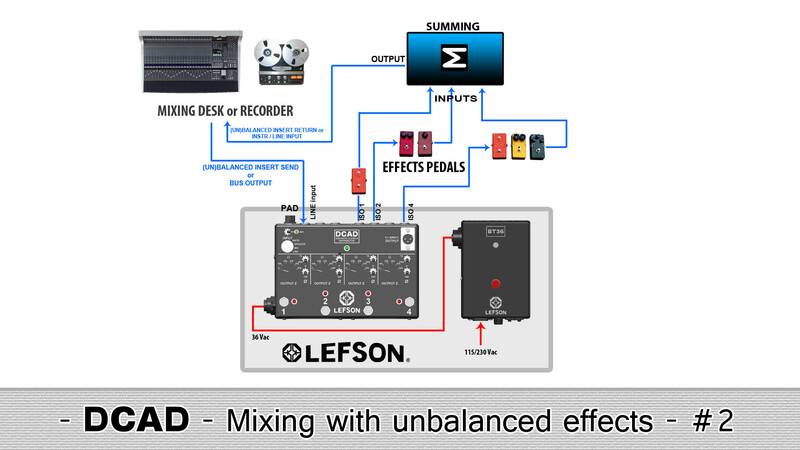 With the LEFSON DCAD, you can easily insert unbalanced effects in your mix !